Cutting benefits for seasonally unemployed workers is not just unfair, it’s bad for the local economy. In Savannah, it is not just school bus drivers, food service workers and custodians that have historically drawn unemployment benefits during seasonal layoffs- hundreds of hospitality workers do too. Hospitality workers are not impacted by the new rule change to eliminate summer unemployment benefits. But at the rate Commissioner Mark Butler is going, they may be next. Stripping essential unemployment payments from 500 educational workers in Chatham County will directly impact the local economy. According to the non partisan Georgia Budget and Policy Institute, each $1 of unemployment payments creates up to $1.90 in local economic growth as these workers pay for basic necessities from local businesses. That equates to millions of dollars taken out of family budgets and cash registers. Labor Commissioner Mark Butler’s strategy has been to attack the unemployed by slashing benefits- from the weekly amounts paid, to the number of weeks an eligible employee could draw benefits, to this attack on educational workers. In a May 7th press release, Butler asserts that educational workers should be treated like teachers who do not receive unemployment benefits during the summer. However, the Labor Commissioner fails to point out that teachers are offered the choice to get paid on a 12 month cycle- an option not afforded to subcontracted school bus drivers and custodians. These educational workers are not given guarantees that jobs will be available at the end of the summer as the school system has ultimate discretion over what work will be needed or not for the fall and spring classes. Butler further states that it was the Georgia DOL not the federal government that ‘determined’ through its own review that a rule change is necessary now. 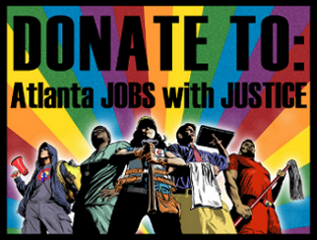 Georgia’s unemployment trust fund has been negligently de-funded for over a decade through tax breaks to businesses that all started when the economy was strong and has continued through the recession. With the passage of legislation signed into law by Gov. Deal earlier this month, Georgians now have among the lowest number of weeks of benefits in the country- from 14-20 weeks, down from 26 weeks. Currently, there are 1.7 million Georgians living in poverty. There are 482,321 unemployed workers in our state, while only one-third receive unemployment benefits, and compete against 5 other job seekers for 1 job. Unemployed workers may be a good political scapegoat, but they are not the problem. Cutting unemployment benefits for Georgia’s educational workers is bad economic policy at the worst possible time for working families and small businesses. IT’S UNDERSTANDABLE that about 500 local school bus drivers and bus monitors are upset. They just learned they won’t be getting unemployment checks to tide them over during the summer break. It’s one thing to be told at the start of the school year not to expect summer pay. Then, they would have time to find temporary work. But getting this news just before classes are about end is harsh. That said, they should consider themselves fortunate. State labor officials said these benefits were improper and these workers shouldn’t have been getting them to begin with. Unemployment benefits help people who lose their jobs through no fault of their own. They’re a safety net, not supplemental income for workers who are still technically employed. In the case of the drivers and monitors, who work for First Student, a private company that the Savannah-Chatham County school district pays to transport students, it appears these employees don’t lose their positions when students are out of school (unless, of course, First Student makes them all reapply for their positions year after year). Rather, they simply don’t work for the months when schools are closed. And no work means no pay — and no unemployment benefits. That’s what Georgia Labor Commissioner Mark Butler explained this week. He said the unemployment benefits that these workers had been receiving constituted a violation of federal law. That law states educational workers are ineligible if there’s reasonable assurance they will return to work. It’s easy for angry First Student employees to paint Mr. Butler as the bad guy. It’s even easier for union organizers — in this case, Teamsters Local 728 — to exploit this anger by staging a protest last Wednesday outside the Georgia Labor Department office on White Bluff Road. But the Teamsters picked the wrong target. If they’ve got a problem with people collecting benefits to which they’re not entitled under law, they should take it up with Congress. Interestingly, it wasn’t management who triggered this. Instead, it was other Savannah-Chatham County school system employees who don’t get summertime unemployment checks. They blew the whistle. They apparently questioned the fairness aspect. Tom Krause, a labor department spokesman, said the agency flagged the benefits for the bus drivers and monitors after getting these complaints. And it affects all private, non-school staffers who work for school districts across Georgia, not just those in Chatham County. This action could affect First Student’s operations, too. If the company’s bus drivers and monitors know they won’t be getting benefit checks during the summer, how many of them will stick around with First Student for the fall? For those workers who expected checks this summer to help pay bills and living expenses, the timing couldn’t be worse. But the law is the law. Unemployment benefits are designed to help unemployed workers keep their heads above water while they search for new jobs. It’s not free money for people who are still employed, but who are temporarily not working. Well how is adding to the poverty level aiding the economy, & what is more important profits for major corporations, or ₱£o₱L£????? "Verify Our Work, Not Our Papers"